This is something that we have been looking into for our Master's program, but haven't had the funds to get at this point. It's definitely something to try, and thank you for the post! Hi. I can't find a way of contacting you other than posting a reply. 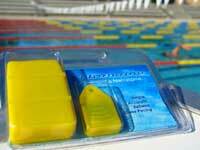 I'm a coach with Swim Smooth, we distribute the Wetronome. Thanks for your positive comments about the 'nome. Please email me if you would be interested in reviewing a Wetronome and we'll send you out a sample. We're think they're extremely valuable for nearly any swimmer and are keen to spread the word as widely as possible.